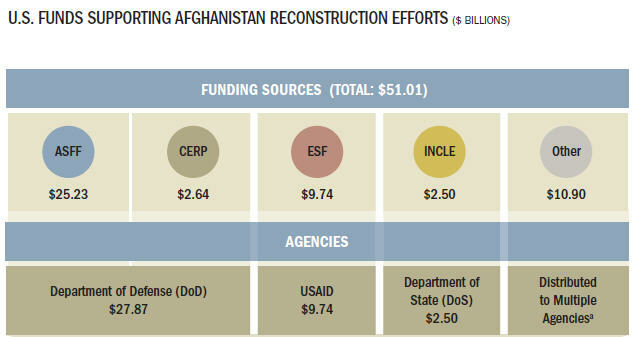 As of December 31, 2009, the United States had appropriated approximately $51.01 billion for relief and reconstruction in Afghanistan since FY 2002. This cumulative funding total is based on data reported by agencies and amounts appropriated in FY 2010, as shown in Appendix B. This total has been allocated as follows: $26.75 billion for security, $14.75 billion for governance and development, $3.75 billion for counter-narcotics efforts, $2.05 billion for humanitarian aid, and $3.72 billion for oversight and operations. Figure 3.1 provides an overview of the major U.S. funds that contribute to these efforts.